When the days are sun-filled, and your garden is lined with flowers it’s natural to assume your sniffly nose and sneezing is due to hay fever. Similarly, when it’s cold and damp at the beginning of the year and you’re constantly sneezing, you’ll probably think it’s a cold, but did you know that tree pollen starts to release in February? Here you’ll find out if you’re suffering from hay fever or if you have a cold and how our private doctors can help. Most colds do occur during the winter months, but you can catch a cold at any time of the year. You can also develop hay fever at any time in your life, even if you’ve never had it before. However, on the flip side, you can also stop suffering from hay fever for a year, even if you’ve suffered from it before. Coughs are also a common symptom. They are most commonly caused by viral infections such as colds, but hay fever can also lead to dry coughs when pollen counts are high, so keep an eye on the pollen count and ensure you keep your fluids up on these days. Some lesser known shared symptoms include tiredness, headaches and difficulty concentrating. A cold is caused by a virus, whereas hay fever is caused by an allergic response, typically to pollen. So, if you suffer from red, watery, itchy eyes, painful ears, itchy palate (that’s the back of the mouth), then it is probably hay fever, as these symptoms are rarely experienced when you have a cold (with the only exception of having an itchy nose before a sneeze – which occurs in both). Another good indicator of whether it is a cold or hay fever is the colour of your nasal discharge. If it’s a cold, then your nasal discharge is more likely to be yellowish/ green. If it’s hay fever, it will most likely be clear. A sore throat is a frequent indicator of a cold, but is rare with hay fever. If you are suffering from a cold, you are very likely to have muscle aches and a fever. Although it is in the name – hay fever – aching muscles and a fever aren’t actually symptoms of hay fever. Whilst both conditions are usually seasonal, they can come about at any time of the year. 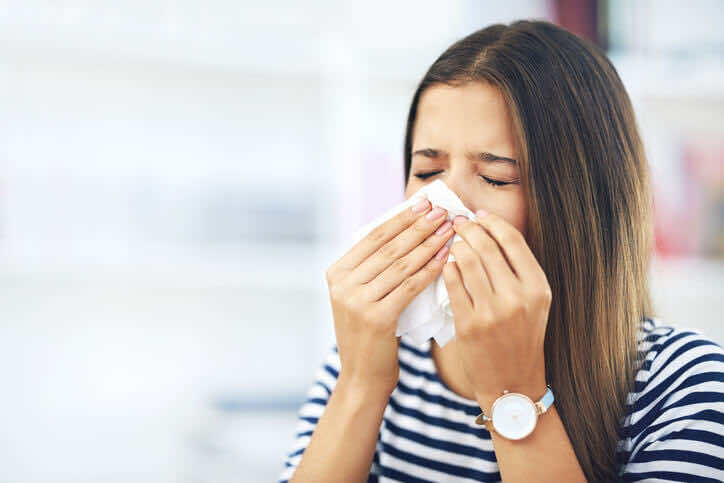 Colds usually have a duration of up to 14 days whereas hay fever can last for up to months at a time, as long as you are in contact with the allergen. Moreover, cold symptoms tend to come about more gradually whereas hay fever symptoms tend to come all at once. Sneezing is a common symptom of colds and hay fever! If you’re struggling with either a cold or hay fever, we can advise you on how to manage your symptoms and provide treatments at any one of our central London GP surgeries, We often have same day doctor appointments available, which means no length queues – better than a traditional walk in clinic!